More than a dozen migrants where released from their detention center and dropped off at La Plaza Brownsville Bus Terminal to catch their bus ride to their final destination in the U.S. early Friday morning by federal ICE agents as they look through donated clothes and receive back packs filled with everyday living neccessities all donated by Good Neighbor Settlement House in Brownsville. BROWNSVILLE — Volunteers from faith-based and grassroots organizations have spent their early morning for several weeks helping people released from an immigrant detention center prepare for their journeys across the country. They are continuing work that started in McAllen when public outrage over the Trump administration’s “zero-tolerance policy” and family separations at the border hit its peak earlier this year. Four volunteers from the Good Neighbor Settlement House greeted 15 immigrants who were dropped off around 6 a.m. Friday by Immigration and Customs Enforcement. Volunteers helped them get their bus tickets, use their phones to call family members, distributed backpacks, food and offer rides to those heading for the airport. Those in the process of seeking asylum are sometimes dropped off at La Plaza at Brownsville Terminal with little more than the clothes on their backs, said volunteer Jim Pace. 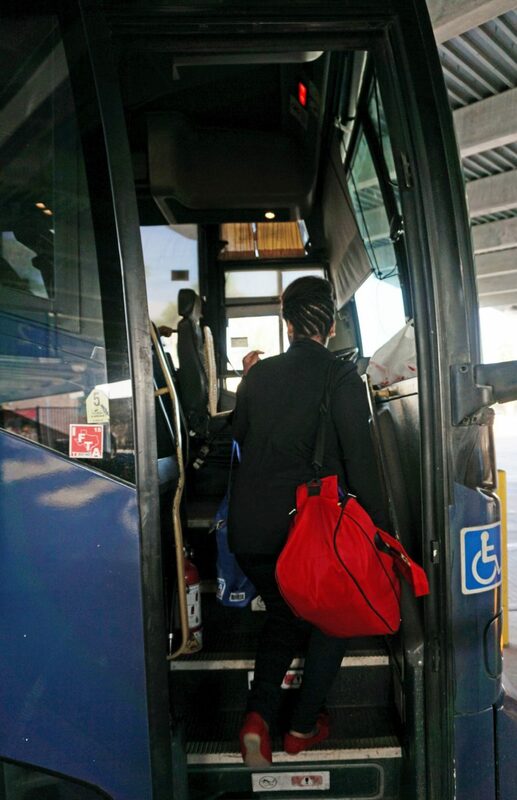 A migrant woman boards a Greyhound Bus Friday morning at La Plaza Brownsville Terminal to reach her final destination in New York City. Jack White, executive director of the settlement house, said the original intent was to give shelter to immigrants dropped off at the bus station at night. Meeting them in the morning has had an impact on the number of volunteers who can help, he added. As the arriving immigrants settled in, Pace talked with 27-year-old Augustine from Cuba. Augustine said he traveled through 13 countries before turning himself in at a bridge in Matamoros, and he was detained for 38 days. Pace said the migrants are given temporary asylum until their case is heard by an assigned immigration judge in the area to which they are traveling. Those immigrants helped Friday were heading around the country, including New York, North Carolina and Florida. They were joined by volunteers from Angry Tias and Abuelas, a group started in McAllen to give supplies to asylum-seekers released at the bus station there. The men, known as Los Primos, brought clothing donated by their friends and cards with information on how to find pro bono legal services. Sergio Cordova said he has been coming to the bus station to distribute donations for about four weeks, after another member of Angry Tias and Abuelas spread the word that immigrants were being left at the station. “What I’m guessing is when the court system said they wouldn’t do ‘zero-tolerance,’ I think that’s when they started releasing people,” he said of a federal policy that required criminal prosecution of all people illegally entering the country. The Trump administration on Thursday announced new regulations that would discard a limit on how long immigrant children can be detained and allow the government to hold families until their immigration cases are decided, the Associated Press reported. John Chosy, Good Neighbor Settlement House development director, said Interim Brownsville Police Chief David Dale told the group recently released detainees are targets for robbery and other crimes. Police have stepped up their presence in the area, Chosy added, and volunteers have worked with leadership at the Port Isabel detention center to select a safe drop-off spot. Marianela Watson, a settlement house board member, lent her phone to the women contacting their families and trying to sort out money transfers. One woman became worried after realizing she could not get the funds her sister had wired without an ID, fearing she wouldn’t have money during her three-day bus trip. Daniel, 27, spent the day at Good Neighbor Settlement House on Thursday as he waited for his bus to Massachusetts. The Guatemala City man said he had a job at a gasoline station but decided to flee when gang members threatened to kill him if he did not join them. Daniel said he crossed the river near Reynosa and was detained for 44 days. He said he was grateful to the volunteers who met him at the bus station because he didn’t have any money or know what to do next. He plans to donate to the organization so they can continue that work.